EMT class + calving season = I'm so fried. So, let's do a Q&A sesh! plus, I'm curious about what you're curious about. Have you ever gotten frustrated that you weren't learning how to do something in your new life in Wyoming fast enough? If so, how did you overcome that? Excellent! So glad you're writing here again! 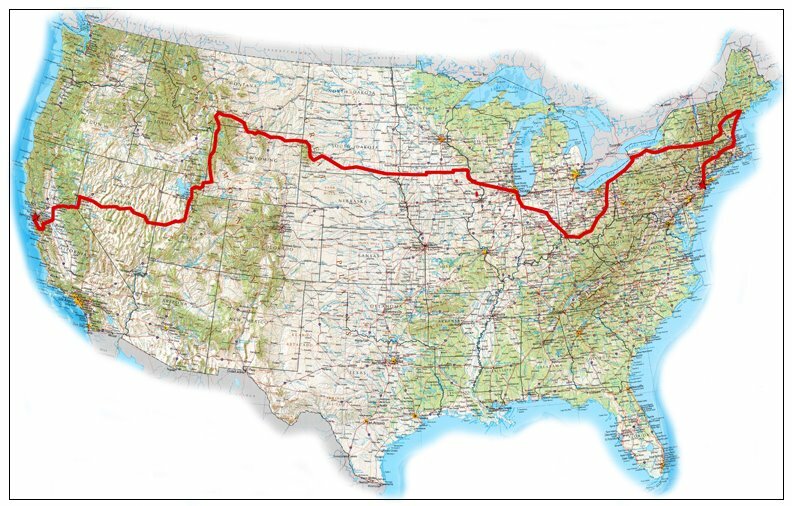 What was the actual route you took (for those of us who hope to take a similar trip one day)? And, I know you said you brought along a few things you ended up never using; is there anything you didn't bring that you wish you had? Do you have a photo journal of your trek? Is there anything that you did while on the trip that you wish you'd done differently? And as a follow up, anything you didn't do that you wish you did? Weren't you scared? Any tense moments? How did you plan your trip? Was there a reason you took the particular route you did? Would you do it again if the opportunity arose? Did you learn anything from the trip? I'm a college grad - maybe around the same age now as when you went on this journey. Any advice for a fellow female who wants to do a similar solo trip? Safety tips, where to stay and where not to say, etc? Did you have any mechanical problems with the scooter, or was it pretty reliable? What comforts of home did you miss the most while on the road? Which aspect of life on the road did you miss the most once you settled in one spot? 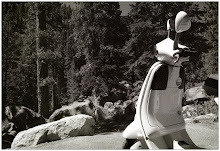 Do you still have your Vespa? Did you keep in touch with your family while on the trip? In your book you mentioned the tense moments with the big wheelers and also all the nice people you met. But I forgot how you actually ended in Ten Sleep,it is quite out of the way. Had you read 'Zen and the Art of Motorcycle Maintenance' before you took this trip? At least part of your route seems to be Persig's in reverse. A random question, but: have you ever thought about writing fiction? I don't have a particular question, but I would love to hear more stories about the people you met and the places you saw. My favorite parts about Vespa Vagabond are your descriptions of thrilling vistas and interesting people. So excited that you're posting on here again! 1. Will there ever be a Shreve movie? The story of your life is too fascinating to keep from the big screen! 2. Did you face negativity from your family/friends about your choices (travelling alone, relocating so suddenly)? How did you cope with that and is it all resolved now? 3. Do you ever think about taking a trek like Vespa, but on horseback? Where did you get your Vespa? Did you get it specifically for this trip or did you already have it? Was there any place you felt reluctant to leave along the journey, or did the journey draw you inexorably forward? Having made several x-country trips via our diesel Jetta with my husband to see "the places between the dots on the map," I find I just try to absorb as much as possible and "digest" it all later. It is much later that odd things trigger memories and longing for the road (sometimes daily!). Do you also find this is so? If so, what are some of your "triggers"? Also, I try not to have preconceived notions about places, but was surprised at times which places have"stuck" with me and I love. Were there places that surprised you either positively or negatively? what was the most beautiful natural sight that you saw on your trip? which state has the best starry night? the best night sounds? forgive me if you have answered these before. I have not read the back entries of this blog. I always marvel at people who manage to cross the continent on little scooters or bicycles. I'm interested in what I see as the biggest challenge for these kind of adventures --- patience. I'm wondering what sort of patience you brought to your cross country adventure. Riding a scooter takes some extra effort after all. And how does the Vespa fit into your life now? Seems a near radical departure unless you are planning some adventure like Ara and Spirit. Regardless, I always loved the lyrical and at times melancholy feeling of your Vagabond stories. Crossing through butterflies in the Central Valley still remains vivid. Hope to read more of them someday. I told my husband that you had crossed the US on one of these and he didn't believe me so thank you for this post. Let me just say that I'm so happy you're writing here again. I'm planning my own trip across the country by Vespa too (the type of scooter is a coincidence - I just wanted something reliable). How in the world did you only spend $288 on lodging over your two months? Did you rogue camp a lot? Please keep writing! Is there a place I can read more about your vespa trip (someone else mentioned a book you wrote)?